People who seek to impeach President Obama should understand he will serve his whole term. The wingnuts among us believe if something can be thought, it can be said, and if it can be said, it can become law, so the talk of impeachment swirls in the corporate media cesspool. It ain’t gonna happen. I know. He is just doing stuff despite the most recalcitrant Congress in history, exercising the power of the executive branch like a fiendish brute and some folks don’t take well to it and are becoming flummoxed. He continues to do it, even when the U.S. Supreme Court checks him, as in checks and balances. In our throw-away culture, it seems easier to discard the president into the trash heap of history and start over with someone else. How much different would President Joe Biden be from the incumbent? Obama is constrained by term limits, so the wingnuts should just get used to him being around until January 2017. Only two presidents have been impeached, and one other left office after articles of impeachment were filed. Impeachment is how the Congress takes a president to the woodshed for being out of bounds, something for which the standard is high crimes and misdemeanors. There is no evidence President Obama committed any of these. Neither of the two impeached presidents was removed from office. The case of Richard Nixon, who resigned, is instructive. A friend was working as an intern in Washington D.C. during the summer of 1974. When the U.S. House Judiciary Committee adopted articles of impeachment on July 27, he went down to the government printing office and picked up a few copies. I remember him waving the document with glee. 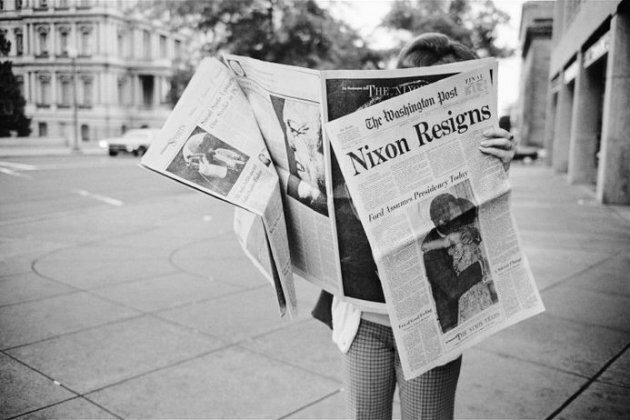 On Aug. 7, Nixon said he would not resign, then he did two days later on Aug. 9. President Gerald Ford pardoned Nixon on Sept. 8, 1974. 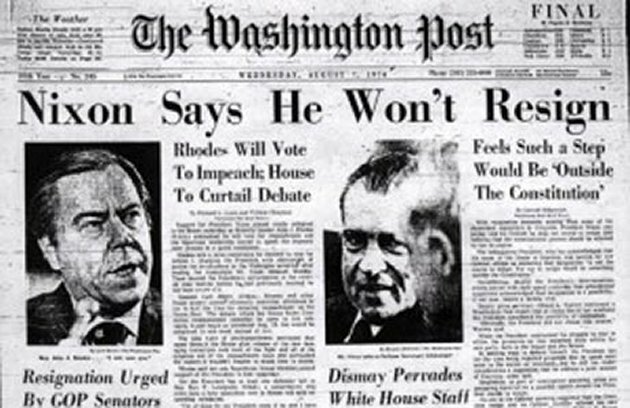 The Congress had the goods on Nixon and he must have known it. What are the goods on President Obama? There aren’t any, except for the good work he is doing without the Congress. Exercise of executive power is constrained by division of powers in our government, and if a president does something, there are consequences. Should the U.S. House of Representatives gin up articles of impeachment on the president, it is almost certain that the U.S. Senate, led by Democratic Senator Harry Reid, will not convict. Even if Republicans gain a majority in the upper chamber during the 2014 midterms, conviction seems unlikely. Congress thought they had the goods on President Andrew Johnson when they accused him of violating the Tenure of Office Act. This law was in force during the Reconstruction era, from 1867 until 1887, and held that the president could remove certain office holders only with the consent of the U.S. Senate. Johnson appointed Major General Lorenzo Thomas to replace Edwin M. Stanton as Secretary of War without asking permission. He hurt the feelings of members who had passed the Tenure of Office Act specifically to protect Stanton. The House impeached, but the Senate did not convict. In the politically charged Reconstruction era, Johnson was acquitted as the Radical Republicans fell one vote short of the two-thirds majority required for conviction. The nation’s first-ever impeachment proceedings did not remove a president, even when there was the political will to do so. President Bill Clinton was also impeached by the House, and acquitted by the Senate. His alleged crimes were perjury and obstruction of justice related to the Monica Lewinsky scandal and the Paula Jones lawsuit. Clinton didn’t miss a beat during a presidency that began during the 1992 campaign with the Whitewater controversy and investigation, was followed by the Kenneth Starr investigation, and only ended when Al Gore rebuked Clinton for the Lewinsky scandal. Clinton later said that Gore would have won the 2000 election if he would have embraced Clinton during the campaign. While President Obama’s approval rating is not what it once was, he is here for the duration of his term. If his successor is a Democrat, expect the recalcitrance of Republican members of Congress to continue and more investigations. Perhaps it is the new normal for Democratic Presidents to be considered for impeachment. Maybe Iowans should ask 2016 presidential candidates during the run up to the caucuses their plan for Republican obstructionism and eventual impeachment proceedings. The smart ones might have an answer. This entry was posted in Barack Obama, President Obama and tagged Andrew Johnson, Bill Clinton, impeachment, President Barack Obama, Richard Nixon. Bookmark the permalink. If I understand succession rules correctly, were Obama impeached and convicted he would be succeeded by Biden. If it happened after January 20, 2015 Biden could potentially serve two terms + the time left on the Obama term. The power of incumbency is hard to beat in politics, even for presidents. Thus were the Republicans to impeach and convict they could open the door to two more Democratic terms.